Despite signing Ed Dickson in free agency, the Seahawks could still draft a tight end. Dickson is 31 in July and Nick Vannett is a question mark after an underwhelming two-years in the league so far. Having lost both Jimmy Graham and Luke Willson, a rookie addition seems likely. They could wait until the middle or later rounds and consider a strong blocking TE like Dalton Schultz, Durham Smythe or Will Dissly. The Seahawks also reportedly scheduled a workout with Dallas Goedert. Indiana’s Ian Thomas is another name to monitor. Grit, adversity, athletic potential. Those are three words to sum up Thomas. Clearly nothing has come easy to Thomas or his family. That’s another box checked off. If he’s capable of that against Rashan Gary, NFL coaches will feel there’s something to work with here. There’s also his athletic profile. At around 6-4 and 259lbs he ran a 4.74 at the combine (improved to a 4.65 at his pro-day). He also managed a 36 inch vertical, a 10-3 broad and a 4.20 short shuttle. Only two other tight ends came close to this kind of physical performance — Mike Gesicki and Tyler Conklin. Thomas also has big 10 inch hands and a +80 inch wingspan (big catching radius). He’s raw and you can clearly see that watching tape. There’s a reason why his most productive season (2017) totalled only 376 receiving yards and five touchdowns. Thomas probably isn’t going to be the next Jimmy Graham, Rob Gronkowksi or Greg Olsen. He’s likely to be a more modest contributor at the next level — but he has almost an unheralded quality. Give him time to develop and he could turn into a complete tight end. He’ll play with intensity and a willingness to block, plus he’ll provide a nice catching radius and the athletic profile to be a mismatch in the short and long game. Tight end might not be Seattle’s #1 priority in the draft but it could be a lot higher up the list than people realise. It shouldn’t be a shock if they take a running back and tight end with their first two picks. They’d likely need to take Thomas in the second or third round. Keep his name on your radar. Seems to make sense mid-late. Could outperform his draft position, so he could be a value pick. Thomas’s SPARQ is 135, too. Puts him in the 91st percentile of NFL TE’s. His 10 yard split was 1.56!! So move him to LEO then? I’m fully on board with them spending one of their top 2 picks on a TE or perhaps even WR. I also think they value weapons in the passing game pretty highly when it comes to the draft. Agreed, Vol. I also believe they allow for a “learning period” for their WR and TE. Luke Willson was given years to develop, as has Nick Vannett. Same with P-Rich and Lockett. I presume they’re doing the same with Darboh. The route-running positions require a lot of nuance. A project player like Thomas, who really only has one full season under his belt, seems right up their alley. Especially since they already have a run blocking TE in Vannett and a pass blocking TE in Dickson. It seems pretty clear that they want to bring in some receiving targets in the draft. Even the RBs they’ve been linked to have been 3rd down types. It’s going to be very interesting to see how things play out, given the coaching changes. What are your thoughts on Conklin? Decent later round option. Good athletic profile. Can make the contested grabs. Injury needs checking. Also, who loves Equanimeous St Brown? My goodness. He fits the Air Coryell mold and is an absolute deep threat. Would love to see him a Seahawk uniform. The dude started every game over the last two seasons. Dependable. Smart. All football. EQ is among my top receivers in this class. Discounted AJ Green. Rutgers HB Gus Edwards is a diamond in the rough. Gonna be a great get late on day 3 or UDFA for someone. Miami transfer, 6’1, 230 lbs., runs hard, has some nice shiftiness for a big back too. Here he is when he was at Miami against Savannah St. This clip is more open field stuff. Gus Edwards had tons of split opinion as a Cane. Very strange, to the point of comical. There was almost a cult following on one side while others didn’t view him as starting material and hated when he received too many carries. There was actually some celebration on Canes forums among that group when Edwards injured his foot and was out for the entire 2015 season. I liked him. Strong determined runner, if a bit upright and north/south. Admittedly I haven’t followed him after the transfer. I attended a Thursday night game in Blacksburg in 2014 in which Miami won handily and Edwards gained over 100 yards in a backup role. Mark Walton is a far superior prospect. Make no mistake about that. Walton is still not earning the mention he deserves and will probably be a big bargain for somebody, based on that subpar 40 time at the combine when apparently his leg injury had not fully healed. Awesome! Haven’t heard of him. TE is definitely on the shopping list! I have no problem with taking a TE. My question though is, and I realize we don’t see what goes on in the locker room or practice, has Vannett really gotten a chance to do much? It feels like he hasn’t. Is that perhaps an indicator that he’s not performing in practice? It’s hard to say. But he didn’t overtake Luke Willson last year. And they allowed Willson to leave this off-season. Didn’t see start seeing more time as the second TE option ahead of Willson as the season went on? I thought maybe he did. I think there were some games where he featured more predominantly but let’s be honest — two years in he’s not done enough. I’d like to see a lot more creativity in the TE use. OTOH, tough to do that when the OL can’t protect Russ. And it’s hard to do THAT when the run isn’t a threat. Bennie Logan going to Tennessee will mean that DL will be a lot higher on the shopping list. On TE, the question is, if we are searching either a blocking TE, or a passing target creating mismatches. If it’s the latter, one have to wonder, if turning Tanner McEvoy into TE would solve the need. Most snaps he played at WR where slot snaps, either. They signed two DT’s in FA and have Reed and Jones. They met with Bennie Logan but they met with a few others too. Doubt today changes anything. Logan signed with the Titans today, terms not disclosed. Ah, okay. Then Edge remains defensive priority #1. But they like to draft DL first, lay back, and let the value-for-money magic work. 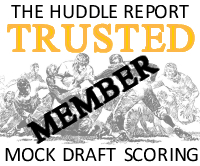 Maurice Hurst fe is a heck of a baller whose draft stock may suffer, maybe too heck for them to pass by late R1, or early R2. I think we need to stop thinking this way. This isn’t how the Seahawks have operated. At all. They have consistently, without fail, attacked their biggest needs and played to the strength of each draft class. When they took Ifedi they badly needed an OT. When they took McDowell they badly needed an interior DL. When they traded for Jimmy Graham they badly needed a big weapon for Russell. Identify the cliffs at each position, identify the needs and pair things together. Think you’re right. And IMO, for a team having a win forever agenda, it doesn’t work. People are making a big thing out Nate Solder going from Pats to Giants. Only the Pats fans are quite sanguine, because that is what they do. They have drafted the Solder-replacement LAST year. His name is Antonio Garcia, I don’t expect the Pats OL to get no problem at all. This is constant team building. Draft to a plan, before needs arise. Without breaking the bank and/or wreaking havoc on other parts of the roster. This may be easier, if you have a solid franchise QB. What the Hawks will do is playing Ifedi for 4-5 years, and then draft his ultimate replacement. Just to start over, despite having RW. I really hope, these days have gone with Cable. IMO, only the Eagles are close to mimick what the Pats are doing, with the Vikes on the same trail. That dude from Yale that Seattle is bringing in for a visit, Foye Oluokun, is a freak athletic profile wise. Good lord. A 6’1 almost 6’2, 230 lb hybrid LB/safety that runs a 4.48?!? I assume he is more a late round prospect ? He was also 2nd team All-Ivy for three years. His highlight reel on youtube is impressive. Would like to see some more tape on him. I would be happy to see a tight end taken with one of our first two picks. Although, TE don’t usually have a huge impact in their first year. I generally believe the overall impact of taking a TE is better than taking a WR in the first. At least when you get a TE, you get someone who can have impact on offense whether you wish to run the ball or throw. I’m not sure if the guy mentioned will be a Seahawk, but I concur with the likelihood of a RB and TE being taken day #1 or day #2 of the draft by Seattle. When the stated goal is to improve the run game…. these two positions provide a lot of bang for the buck. The most obvious would be a OG, but depth at RB and TE is rather slim right now…. and with a nice selection of players to choose from in rounds 2 and 3, worth diving into the RB and TE pool at least one time (provided they can come up with some day #2 picks). Should we be considering SS Troy Apke late in the draft for Seattle? He blew the doors off the combine and has a very impressive SPARQ score. Not a bunch of experience starting, but has decent size. Started as a WR, but transitioned to SS/S his freshman year. Both them Penn State boys (Apke and Campbell) could be options as they both have some explosive numbers. if He goes undrafted he would be a cool CB project. I know this is has been a topic of debate, but what do you think of this report? I know he had some real impressive games even when Fournette was there! To be expected. RB is a big need and there are more questions to answer with Guice than some of the other runners. Just went through a bunch of interview with Guice. He’s a bit odd but mostly on the level. One thing keeps bothering me about Rojo is his weight, and will he be able to be a 3 down back? I know the unicorn is Jamal Charles but does anybody know of other RB’s in the NFL that have been this size and performed the 3 down duties exceptionally well? Just curious. LeSean McCoy. Off the top of my head. Not sure why Charles is a ‘unicorn’ either. Jamaal Charles actually exsists — and Ronald Jones II’s game is virtually identical to Charles’. Also — why is this topic dominating every article? Why are the Derrius Guice apologists/truthers trying to make everything about Guice, every day. Guice was an inside job! Did some research on the size of the best 3 down backs. Yes we all know Charles exists Rob, my point was…is he the only RB of that size that has been a team changing 3 down back. Derrius Guice truthers? Really? Sometimes you come off rather condescending man. I’m just doing some research and trying to substantiate some people’s claims by cross checking information. So these are for the most part RB’s that have had a team changing 3 down dynamic at one point in their career that are currently still playing. As you can see there are several backs on this list that are within the Rojo range. This gives me hope and confirms that he can be a 3 down back in this league. No more underweight talk from me about Rojo….Though I’m not sure I ever mentioned it before. It’s not my intention to sound condescending — but Guice seems to come up every day at the moment regardless of the article. I don’t think he was being condescending at all. I think he was voicing his frustrations that an article about a TE prospect became a conversation about Guice. And that Guice finds a way into the comments section of every article, regardless of topic. For what it’s worth, a lot of people seem to be obsessed with Guice – not just Seahawks fans, but nationally as well. I think it is for a multitude of reasons, mainly because he plays with a lot of passion, runs hard, but is also somewhat polarizing, with some strange character concerns. Personally I think he is vastly overrated, as he is consistently ranked as a top 3 prospect at the position. I would much rather have a guy like John Kelly, would runs just as hard, is just as physical, and you can probably get 2-3 rounds later. How many RB’s 205lbs or under can you name that have had the kind of impact Charles has had? Emmitt Smith and Barry Sanders come to mind. Barry Sanders was in the weight range but come on…..it’s Barry Sanders. Also these two guys were shorter and stockier. Jones weighed 208# at his Pro Day. I don’t understand why you’re so caught up on what amounts to maybe 5-7 lbs. All really good RBs, none of them listed over 210#. Two of the top three rushers in NFL history were under 205#. Eddie Lacy is a big RB. How did that one turn out? How about LenDale White? After the McDowell situation last year Im betting they might sacrifice some upside for a more sure thing. I also think that the McDowell pick was made with their thinking that they had enough of a DL core that included guys like Bennett and Avril who could mentor a guy like McDowell, too. Now that has been torn down (injury/trade) and the team isn’t in shape to be a Super Bowl front runner anymore. Gotta go back to getting a core… which is a really stupid analogy (I just made it – I’m stupid) because why would you ever get to a situation where you weren’t trying to draft “core” (i.e. great) players. As much credit as this FO got early, much criticism is deserved in more recent history – on average. If ever there was a time to turn back the clock, this is it. They can’t have another lousy draft, which is hard with their current stock of picks. Guess he rides to much ATV for Seahawks taste, but he is hell of a running back. Possibly better than Fournette, but with the risk to draw a McDowell. Currently, I’m pretty strongly tend towards Kerryon Johnson. Late R2, maybe R3. Still think, we should try to amass.as many late R2-R3 picks as possible, lot of great guys in that range. Kerryon won’t be there late R2-3. Too good. NFL analyst Zierlein has him projected there, so it is possible. Watching Kamara run last year, you would not have thought him lasting until the 3rd round. I would say most mock’s that I’ve seen has Johnson in late 2nd but I for one think he is super unique and has some Lav. Bell qualities….like patience. This might be exactly the kind of back we need and would love for the Hawks to move back into the second to pick him up within the first 45 picks of the draft. Lance has changed that from a recent R1-2 projection so possibly that will be the case. We’ll see. I have a feeling he’ll be right in the middle of the early R2 rush. Speaking of NFL’s Lance projections, does anyone like The NFL.com website draft prospects new format? I thought the old format was much better. It’s horrendous. No idea why they changed it. Thank you! It is THE WORST. The entire nfl website makeover is hideous, at least on mobile. If you want a nice chuckle, look at Chad Reuter’s 5 round mock on NFL dot com. It of course, has Seattle trading down with Carolina to pick…..CB Josh Jackson. Kerryon Johnson….5th round, and not to the Seahawks, even though they have four 5th round picks. Doug Martz has him late R3, and his draft value board makes a lot of sense to me, despite two weeks old. Think we can omit Rezters la-la-land, but R3 is where he tends to get mocked. The whole assumption of 6 or 7 RBs going R1-2 is, that a team picking RB will create a tsunami, that leads to a “battle for talent” in R2. Half if the teams would massively overpay. Then, it’s also a decent TE class, and a major inside OL draft. I expect every halfway decent G to be off the board by #50, plus Gesicki, Goegert and Hurst at TE. Good for Doug Martz. I think he will be proven wrong. ‘The whole assumption’ — no, there is no assumption. Just a projection based on months of study. For the Seahawks, this is probably the best tight end draft class in recent memory. So many strong Y TEs, and several that have the makeup to be. Thomas, Schultz, Smythe, and more. If I had to be on one position the Hawks will draft between rounds 1 and 5 it’d be tight end. Last year’s class is pretty hard to beat (3 in the first round, 14 taken overall). This year’s class is just better than advertised. I think last year’s class didn’t have as many capable true (“y/in-line”) tight ends. More athleticism and explosion as receivers, sure. Engram is amazing. O.J. Howard is the only one that comes to mind, in terms of a dude that can come in and help your run game by blocking. Even Shaheen, who was like 280lbs at the combine, didn’t really block. It’s “Hear Ye” as in listen to me. Or maybe you were implying “Here Yeah” is my Favourite Seahawks draft Blog? Vannett is only half way through his rookie deal, though. And with Dickson signed, I just don’t see this as a high a need as others here seem to. I agree, but if someone is there that is special maybe you pull the trigger. I would prefer to draft a blocking tight end later myself and give Vannett a legit shot to see what hes got. agree, if you find someone special, it doesn’t really matter where they play or where you draft them. In this respect, draft blabber is kind of nonsense when it’s all on the field. However, here we are 🙂 I guess I’m resigned to being in a minority view here, but I wouldn’t be looking at RB or TE before round 3 or 4. Just me. Besides running back the Seahawks also need to build up the defense. You could also argue that they need another wide receiver, or even a guard. With all those needs, I don’t think they will pick Tight End until 5th round or later. My impression is that most of the tight ends being mentioned are mid to late round guys. So that should work for the Seahawks. Agree. It was the posts about a RB and TE in first two picks that sparked my response. 1. Vannett wasn’t/isn’t all football. Liked “living the life” more than working on his craft. The thing passed on to me makes me question whether Vannett will ever produce. Hope for him, but don’t count on him. 2. As of the beginning of the offseason, this player said from talking to coaches that RB and TE were priority 1 and 2 for the team. This was before the coaching changes, so maybe that’s shifted, but that’s what it was at that time. FWIW, this was before we lost Jimmy and Luke. The player said those guys would only be back if they were willing to take about $6 million and $1 million, respectively, so said both those guys were gone. And voila. Here we are. To be clear, I don’t pretend to be some kind of insider. Those are likely the only things I’m ever going to know, since the player is no longer on the team and the coach he likely got most of his info from is no longer with the team. But we will be drafting a RB and I’d bet good money that we’ll draft a TE as well. Nick vannett: hey man, just let me and my friends in for free. don’t you know who i am? Vannett: I play for the seahawks. Vannett: come on man. I’m a tight end. I play for the seahawks. door guy on walkie talkie: (to other security). Yo man. You gotta come here. I got this frat boy looking, Jersey shore mo fo, telling me he plays for the seahawks. Second door guy: nick, who? I never heard of him. Let me see. Second door guy arrives addresses line outside of bar: any one here ever heard of “Nick vannett?”. I got a guy here saying he’s him. Says he plays for the seahawks. Nick vannett: come on man, I’m Nick vannett. I had that one catch that one time…. door guy: sorry man. I literally don’t remember ever hearing you, seeing you play, or anything….but ‘go hawks,’ amirite? Oh and it’s gonna be $20 a head to get in….. I first read “Frat boy” as Fat Boy and was thinking Nick is not fat by U.S. standards? Hope that embarrament inspired him a tid bit! This is pretty interesting. I remember right around that time, after the season ended, Davis Hsu tweeted out that his insider said RB and TE would be top priorities, as well. I dismissed TE because I felt the draft wasn’t shaping up well for the position, but things have gotten a bit more interesting when it was reported they are looking at Dallas Goedert. It would explain a lot. Upthread I said it felt like he hadn’t been given much of an opportunity in games and wondered why. This tracks with that. Shame if it is true. I’d love to have a difference maker at TE. Hell, as a kid, Todd Christensen was one of my favorite players. Circling back, would it be better to get an average/above average RB in the draft… or would it be better to try for the HR shot? I look at Chubb in the first category, while Guice might be more in the second. I honestly believe Seattle just needs a constant presence at RB, nothing extraordinary. Once the position is calmed down, everything else starts to fall into place. I read into the “taking a hard look into Guice” as … we need to figure out what makes him tick and can we handle any off the field stuff that comes along with him. If they were not digging hard into him, they wouldn’t be doing their due diligence. It might also be long term “intel” on him, if and when he pops loose from the team that drafts him. If you’re a team who wants to identify itself as a running team – you need that horse to ride. Not a bunch of role players. You need a stud and then, yes, some guys who can do some situational stuff or give the stud a breather here and there. I’d be fine with no stud RB if we were the Saints or Patriots. But we’re not. Pete wants to run the ball. While the odds are high that we won’t get another Lynch, the lesson he taught us is that we need a stud to feed the rock to. The presence of Lynch allowed this offense to do so much more. Relying on guys who are proven injury risks isn’t responsible. I’d be fine with NOT drafting a RB high if there was any reason to think both Carson and Prosise will each be healthy. Although football players get hurt, those two have a horrible track record of “health.” Great talents, yes. Durability in their past, no. Yep. Need a bell cow to ride that has the ability to be a difference maker, not just another JAG injury risk in our RB stable. Rojo or Chubb. Also highly suggest no trading down below 31 so we don’t cute trade down ourselves out of range of one of the 2-3 RB we need to choose from. We will be able to get Chubb @ 50 or later. I don’t see anything wrong with a RB by committee approach as long as it’s effective and productive. What effective difference does it make if it’s 3 guys totaling 2000 yards or 1? It probably doesn’t matter except in the concept of tone. As Rob has mentioned before a running back that gets 60 yards looks pretty lame. Except when it was lynch and that to hold him to 60/yards it took 8 plus in the box or you get the chance to watch him fly backwards into the end zone grabbing his you know what. a committee is great if the team has to count for the running game. But last year no team had to respect the run so it makes everything more difficult. With that note personally I’m pretty down on the runningbacks currently. I hope the absolute best for Carson but he has never been able to carry a full load. Davis is a super feel good story. Mckissick is a wr and has been as effective as……prosise a guy who needs no introduction. Plus solari still runs a version of the zone so it seems…zone guys need to feel out a rhythm to break runs and getting 8 runs and then the hook to ride the pine at least with the old cable system felt like no one could get a feel on what was happening. I hope dollar’s system mitigates some of that. Running Back by committee also means that all 2 or 3 running backs need to perform. Seahawks have been lucky to get one guy going. Besides they have McKissic and other role players. They need someone dependable to carry the rock. I suspect they solved most of that problem when they told Cable to pack his bags. I agree with you about the “stud” running back. If there’s a guy available whenever the Hawks first draft pick happens, I think they’ll take him. If there ain’t one, they have plenty of needs to draft for. I would hate to see them reach for a running back, and have him pull a “McDowell” on them. Kind of funny that you point to the Saints as a non running team. I think Seattle wants to mimic EXACTLY what the Saints did last year. The Saints underachieved for years with an elite QB thanks to a mediocre run game and a terrible defense. They finally became a run first team last year, which took the pressure of Brees and look at the result. I think Seattle wants a situation like that, where they have multiple runners they can rely on and share the load. That not only provides insurance for injury, but also keeps opposing teams guessing, and gives you so much flexibility on offense. I think they like Carson a lot, but probably want another talented back to give them a 1-2 punch. They’ve stated they had a second round grade on Carson. If they draft to their roster as they claim, how much sense does it make for them to spend another high draft pick for the same position a second round talent already plays? Especially when they got that second round talent in round last year? If they do indeed spend two of their early picks on RB and TE I’ll be disappointed. But it won’t be the first time this front office has bewildered over the past 5 years. They have a lot of needs for sure, but I think RB is at the top of the list. Carson looked great, but he’s really the only viable back on the roster. Look at what happened to your run game after he got hurt last year. 5th worst rushing attack (RB production wise) of ALL TIME. That can’t happen again. They know that. I don’t envision picking an RB in the 1st, but if they trade down and acquire a late 1st/early 2nd and another day 2 pick, I would envision them using one of those day 2 picks on an RB. Especially given that this draft is loaded with talent at that position and that is the sweet spot. Personally my favorite RB in this draft when factoring value is John Kelly. I think you could get him in Rd3-Rd4 and his style of running is tailor made for Seattle. To your point, I don’t think they will spend an early pick on TE. Not with this class and their emphasized need to improve run game (i.e. blocking TE). But RB on day 2 is very much in play. And the way this draft sets up, I think it would be wise to do so, then address other needs a bit later (DE, LB, CB/S). What would be the ideal position to address with your first pick in the draft? Many would say OL, but I think this FO is tired of using high draft capital on that position with little to no dividends. It’s clear they aren’t the best at drafting OL, so at some point you need to try to develop what you’ve got. Although I wouldn’t be mad if they got Will Hernandez or Isaiah Wynn. But my gut says they are going to stick with what they have and put their faith in Solari to get the most out of them. Outside of that, maybe LB or edge? There should be a few decent options. I would actually like to see them take a pass rusher or dynamic LB with their first pick, then RB with a second pick acquired in a trade down..
Have you all seen the mock draft on the seattle times website? It’s really good. It’s almost like he is a reader of the blog. Probably totally unrealistic, but this was fun. Pick a team and draft for them. I wish it would include possible trade scenarios. Yep, only on the paid version. Even then the big boards are so bad the results are still unrealistic. NFL.com’s Chad Reuter had a 5 round draft 3-4 days ago, and has the Seahawks trading down with the Panthers at 24 and also picking up their 3rd round #85 pick. He has them taking at #24-Josh Jackson, CB, Iowa, round 3 from trade #85-Shaquem Griffin, LB, Central FL (definitely agree with this one either in the 3rd or 4th), round 4 #120-DeShon Elliott, CB, Texas, round 5 #141-John Kelly, RB, Tenn., #146-Chris Herndon, TE, Miami, #156-Kentavius Street. DE. NC St., and at #168-Anthony Coyle, OT, Fordham. #141 – PJ Hall, NT/DT, Sam Houston St. Tempted to pick Kerryon Johnson of Auburn, but that must have been a joke that he had him in round 5, he may not make it out of round 2. CB Hill may be a mistake because he may have similar maturity issues as McDowell last year, but he does have the size, speed and skills for a good CB. And if DE Street was to drop like a rock with the recent ACL tear, might take him late on day 3 if he was available. Also hope that JS trades down 2-3 times like last year so we can get additional picks on day 2, and/or gets another 1st or a couple 2nds for ET if we trade him. Oh really! As much fun as that would be lol yes the draft boards are all over the place. It is interesting to look at what may happen with the signing of udfa. Not only does the team have a history of signing these guys, agents know that there is a reshaping of the team going on and may see an opportunity. Quarterbacks should be interested, kickers, punters, DB’s of various sorts, and maybe some offensive linemen. We need a linebacker, a pass rusher, my dog, what don’t we need? It seems that the team will be able to bring in a strong fa class this time. That is exciting to me. Many of these developing players have not reached the levels that may get to. If we find them, like Doug Baldwin, we win. As always we are somewhat dependent on our scouts, coaches, and front office, but they have done it, sometimes, in the past. I agree, I think this will be similar to the first few years for PCJS where they bring in a ton of UDFA and those guys have a legit shot of not only making the team, but having an impact early. The same couldn’t really be said the last few years with most of the roster spots already set. Side note, what’s the arm length on your dog? 10 yard split? Is he “all ball”? We need to know these things. Our hopefully future day 3 safety pick Jamerson of Wisconsin looked great in the East-West Shrine Week practices and game: “Wisconsin safety Natrell Jamerson has gotten his hands on a lot of passes this week, and that continued Wednesday afternoon. During the team scrimmage, Jamerson flew over to track down an overthrow in the middle of the field for an interception. He showed good instincts and speed to get over the top on the receiver. In the red zone team scrimmage, Jamerson had a good hit to separate the ball from a receiver to get an incompletion. Jamerson has illustrated good ball skills and the ability to get in position to make plays in coverage throughout the week. Another guy who helped himself at the Shrine game and proved he has plenty of speed to go with his size and sure hands is Penn’s Justin Watson. “Another wide receiver who has impressed team sources is Penn wideout Justin Watson. They say that Watson had a lot of good tape in college, but considering his level of competition, teams were eager to see if he could be as good against more talented defensive backs. Watson has proved up to the task this week, producing quality sessions each day. The 6-foot-2, 215-pounder is built solid and runs well for his size. Watson was very good in the one-on-ones and the seven-on-seven session. He is a tough receiver who runs the staple routes of the west coast offense with slants, digs and crosses. Watson has run-after-the-catch skills and is good to shield the ball from defenders. Not many Ivy League players get drafted, but Watson could be a third-day pick in the 2018 NFL Draft after his strong week in Mobile.” And at Tony Pauline’s Pro Day Reports: “Watson, who impressed scouts at the Shrine Game and participated in the Senior Bowl but did not receive a combine invitation, measured 6-foot-3 and 215 pounds. He completed 20 reps on the bench, touched 40 inches in the vertical jump and reached 10 feet in the broad jump. The nose tackle/DT I really hope we get with a mid-round pick is PJ Hall of Sam Houston St. The main focus after bolstering the running game according to Pete is getting more speed on the team, and this guy seems almost Aaron Donald fast and explosive. According to Tony Pauline’s pro day reports: “Hall, who was dominant for three days of Shrine practice, measured 6004 and 308 pounds. He touched an impressive 38 inches in the vertical jump, reached 9-foot-8 in the broad jump and completed 36 reps on the bench. NFL.com just did an article on him Wed., but have been meaning to post and ask about him since seeing his crazy pro day numbers early last week on Pauline’s site, and this for a shorter DT like Grady Jarrett with Aaron Donald speed, but I don’t think Donald can jump 38 inches at 308 pounds like this guy! Check out at 2:35 of the 2nd highlights video him chasing down our former speedy RB Troymaine Pope from across the field and 50+ yards downfield, catches up and is side by side, then is helped by the JSU QB trying to block him, pushes him into Pope for the tackle. Can line up at DE and chases down RBs, QBs behind the line and spin-throws them down like rag dolls in the video. Really hope we can draft several speedy talented players at a variety of positions like Hall, Jamerson, and Watson above, also of course Ronald Jones of USC, Shaquem Griffin, LB/Edge Jacobs of Wisc. as Rob has mentioned. Have always loved Earl Thomas being a Seahawk and if we had tons of cap space would want to keep him at maybe a 3-4 yr. 40-50 mil. cap friendly deal, but it’s obvious unfortunately we’re trying to trade him. Have seen at over the cap.com that the Cowboys only have around 2 mil. available and couldn’t afford him. Heard rumors that JAX let some players go to have the room and have 18 mil. in cap space – would love to have their 1st, or the colts have almost 60 mil., their 2 high 2nds would be great – they have 3 2nds after the trade with the Jets I believe. Have been reading this for over 2 years, and you just keep getting better and better with more and more detail-oriented articles. Don’t know when you find the time with a full time job and family. Thanks so much for all you do here, plus the podcasts with Kenny, Seahawkers, etc. are all great too. Nice spotlights. I really like PJ Hall. Would he play a similar role to Bennett, lining up at DT or DE depending on situation? You have to think that the Hawks will be interested in a DT who used to play TE. His explosiveness really jumps out on the tape. Rob. Let’s say Earl Thomas plays for Seattle in 2018. Let’s say they can sign him to a long term deal. Do you think the Seahawks would slap a franchise tag on him? I don’t know. Would depend on how he plays and whether the team felt the value was there, plus whether it’d be a manageable situation. At that point if we tagged Earl it would be with an eye toward trading him to another team, methinks. And actually, I’d be okay with that. Franchise tag on a safety would be relatively cheap for the first year, no? Count me in the camp that wants to see us acquire a true feature rb. I still tear up everytime I watch a beastquake highlight reel. I would never diss the smoothness and speed of S.A., but boy I sure did love me some Ground Chuck back in the day. I know that the game and the league have (like Rolands Midworld) have moved on since the days when I had hair, but Im going to appeal to the old timers among us-those who have a keener eye than I do and see more college ball-is there one among the current crop of rbs who is a comp for my first great Hawk player-crush-Kurt Warner? Rob can you clarify what you classify as a ‘gritty back story’ please? Pretty sure I saw a post on SDB recently when someone was talking about a player with drafting potential who lost a parent when he was young and battled through all that and you said that was irrelevant? I said that I didn’t believe Guice’s ‘backstory’ necessarily had impacted his football career. He lost a parent at a very young age. So did Ronald Jones II for what it’s worth. Both of their dads died when they were kids. People, including me, don’t talk about that with Ronald Jones II. It’s not always what determines ‘grit’. Ian Thomas lost his mother and father in the space of a year and was brought up with multiple siblings by an older brother. That’s a very different situation. Nice player, but I wouldn’t draft him before all of the other needs that we have. He’s not special enough for me to say go for it. If he were to fall to day 3, (and he might not), great. But I like 3-4 TEs better and a couple you could maybe get on day 3. Cole Madison set to visit the Hawks. LSU Basketball player 6′ 3″ 270 after an inspiring pro day, said he had already talked with the Hawks. Reuter has Ian Thomas going to the Ravens @ pick #83. After the Sr. Bowl I had Thomas as being underrated. I like him a little better than Smythe and Shultz for what we need @ the TE position. Got your names mixed up. Cole Madison is a tackle out of Wazzu set to meet the Seahawks. The LSU basketball convert is named Brian Bridgewater, whom Seattle’s spoken to. Or I might have just realized that you actually did mean two different people. We had private workout with RoJo. Hell. Yes. I’m loving the names on that list. Looks like if they don’t go Mo Hurst they’ll go DT later on in the draft (Poona/Abdullah). Makes sense—considering next year’s draft class is stacked there. Is this workout you couldn’t speak about? Old, but good and involving our own Rob. Oh, and the argument about only 1 QB going in the top 15 not going to happen? The first QB went off the board at #16 that year. Barkley fell to the 4th round. Just one of many, many examples of Jared talking out of his backside. I had heard of Jared Stranger just read that link Logan Lynch provided. What a narcissistic A-Hole! Trying to win a Disagreement with Rob, Yeah Right! Yo Jared, you Frack with Rob you Frack with the Whole SDB! Jared Stranger (To Logical Thinking) can kiss it! Been reading up a bit on the “air Coryell” offense. The Chargers and the “greatest show on turf” Rams. I can see Russell Wilson matching up comparably with Fouts or Warner and Doug Baldwin performing similarly to Charlie Joiner. Do we have the receivers to pose the serious vertical threat that is the trademark of that style offense? The Chargers has Chuck Muncie and Kellen Winslow while the Rams had Marshall Faulk. Unless the Seahawks consider RoJo a legit threat as both a runner and receiver this draft seems set up for the Hawks to pick a bigger Muncie style back (Chubb, Freeman, Johnson) along with a tight end with some pass catching capabilities. The problem with an offense like that is that the quarterback is expected to stand in the pocket and throw deep, regardless how many times he gets creamed. There’s a reason it was initially popular then went away. Quarterbacks make too much money to do that anymore. Lockett is a serious deep threat. He’s still young and in a contract year, it could be a breakout season, especially of Schottenheimer can find mismatches in coverage for him. But Allen Lazard, Equinimious St. Brown, and Jaleel Scott are all big receivers that could be vertical threats. I’m really excited for this new offense, we just need to get Russ his franchise back. Felt to me like Lockett still wasn’t 100% last year. Maybe it’s my imagination. Dallas Goedert is the only tight end who looks like a special talent to me. I would start and end there. Gesicki has excellent test scores but he doesn’t play as athletic as he tests and there’s a disturbing softness throughout his game. Seems to me this TE class overall is either get a top 3 or 4 guy or simply take a swing on big upside or a pure blocking TE late. We don’t presently have the resources to waste a pick on a maybe at TE. Not another Nick Vannett type, please. Really Goedert, Gesicki, or maybe Andrews get me excited. The cost is probably too great given needs at other positions. I am all for a trade back if we can get a very early 2nd and 3rd say 33 and 65 from Cleveland. But depending on who is still on the board I am not sure trading back to pick up a late 3rd makes a ton of sense. We have 5 picks in the 4th and 5th rounds. How much difference is there in the quality of player avaialable in the 90s or 130s? For example if we trade back to the early 2nd and miss out on Ronald Jones, Wynn etc. In order to pick the 5th or 6th rated RB and a blocking TE or rotational DT I just don’t see the value. All depends on who is on the board and how far they trade back I guess. I have just found often when JS trades back we end up missing some elite talent to draft a several average guys.